This weekend's plan started off on Sol 2301 with some Mastcam atmospheric observations, followed by ChemCam analysis of "Loch Ness" and "Loch Skeen," examples of brown and gray bedrock. ChemCam also had a long-distance image mosaic of an interesting outcrop in the clay-bearing unit. Once the remote sensing was done, it was time for some contact science. MAHLI collected some images of Loch Ness before and after it was brushed, as well as the target "Puddledub." APXS then took a turn, with a quick analysis of Puddledub and an overnight analysis of Loch Ness. On Sol 2302, we started off with a Navcam atmospheric observation, followed by Mastcam multispectral observations of Loch Ness and Loch Skeen. Mastcam also had a large stereo mosaic surveying the clay-bearing unit that we will soon be exploring. We then drove for about 32 meters and collected some post-drive imaging including our routine Mastcam "clast survey" to document changes in the rocks and soils along our traverse, as well as some additional Navcam images to help with imaging the pediment that is looming large just beyond the clay-bearing unit. 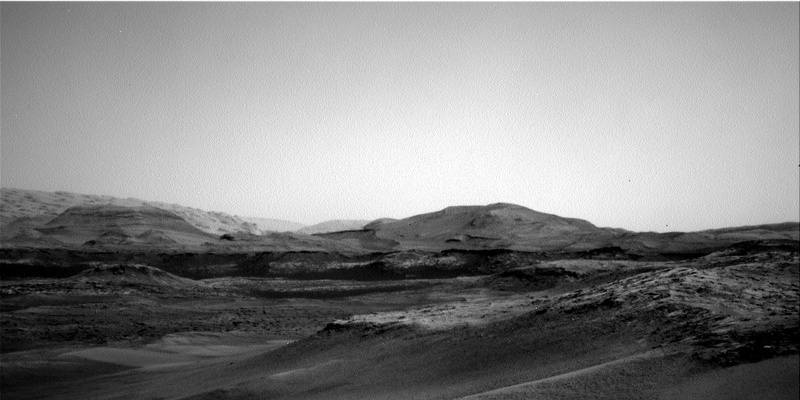 This was followed by some Mastcam atmospheric observations and a MARDI image of the ground beneath the rover. Sol 2303 was dedicated to atmospheric observations, with the usual Mastcam "tau" images plus several Navcam movies. Some of these were pointed at the sky to watch for clouds, while others were pointed out across the crater floor to watch for dust devils.